The water of the river Erriff (An Oirimh) falling down the waterfall Aasleagh Falls (Eas Liath) in northern Connemara. 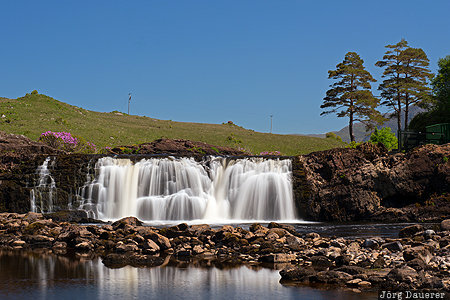 Aasleagh Falls are in Connemara, County Galway in the west of the Republic of Ireland. This photo was taken at noon on a sunny day in June of 2016. This photo was taken with a digital camera.